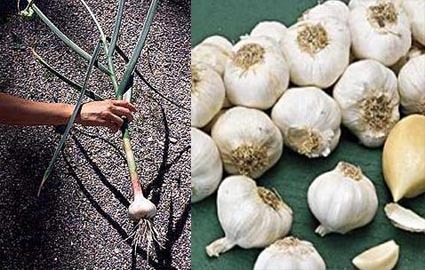 Medicinal uses: Garlic has been used since before the invention of antibiotics for the treatment of many infections from tuberculosis to typhoid. It was also used to dress wounds in the World War I. it is an excellent remedy for all types of chest infections. It is good for colds, flu, and ear infections, and it helps to reduce mucus. Digestive infections also respond well with garlic. It can also help rid the body of intestinal parasites. Garlic prevents circulatory problems and strokes by keeping the blood thin. It lowers cholesterol levels and blood pressure. Garlic may be taken to support conventional antibiotics and to ward off their side effects. It also reduces blood sugar levels and can help in late onset diabetes (Chevallier 59). Additional uses: The dried flower heads can be used in flower arrangements. As a companion plant garlic is considered to help control pests, especially aphids (Kowalchik 218). Nutritional information: An excellent source of vitamin B6. It is a very good source of manganese, selenium, and vitamin C. it is also a good source of phosphorus, calcium, potassium, iron, and copper (Murray 201). Cautions: Use caution if taking hypertensive or blood thinning medication (Chevallier 59).